Konnichiwa and G’day mate! What do you get when you get a fusion of Japanese and Modern Australian flavours? The result lies in Nine Fine Food. Nine Fine Food offers fine, quality, modern Japanese with a twist of Modern Australian flavours. It was my friend, Clara who recommended and chose to dine at Nine Fine Food to celebrate her 21st. So just like my previous post, I have invited a few guest writers to be a part of this post. For our dinner, we decided to order the TokuToku (3 course) set menu ($53 pp). We were also given a few choices to choose for our Entree, Main and Dessert. For the Entree, 5 of us ordered the Agedashi Toothfish which consists of Pantagonian Toothfish, soft tofu, mushroom and wakame in Agedashi broth. It was a very good Entree to start off with. The Agedashi broth was full of flavour and I nearly finished the whole broth. 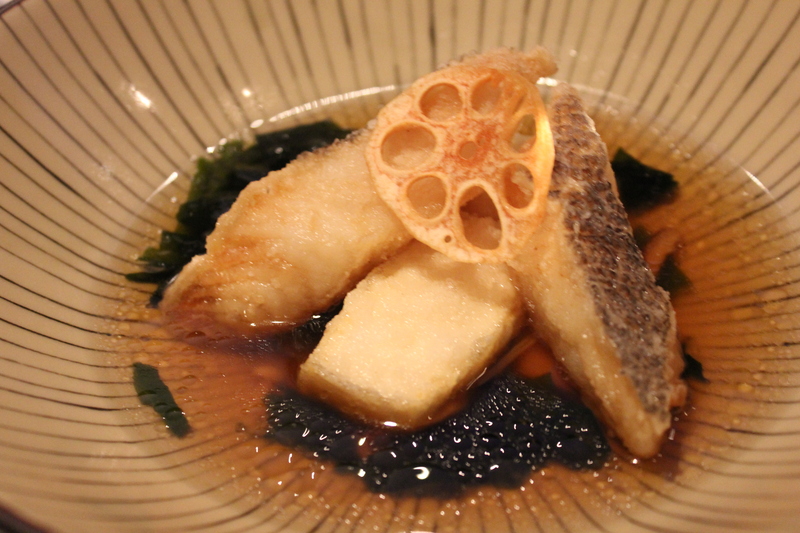 The Pantagonian Toothfish was cooked beautifully and the texture of the Agedashi Tofu was soft and silky. You can never go wrong with Agedashi Tofu. 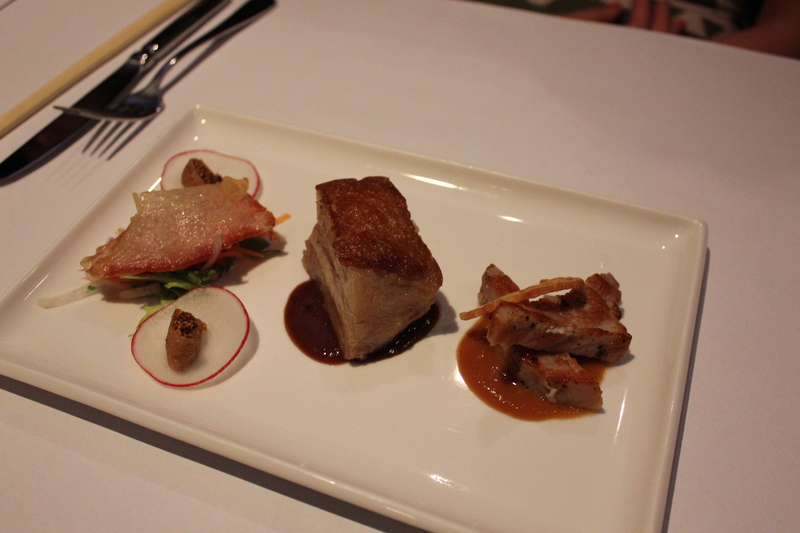 Tika’s review of her Pork & Pork Entree: It was beautifully presented and was organised into three little portions. 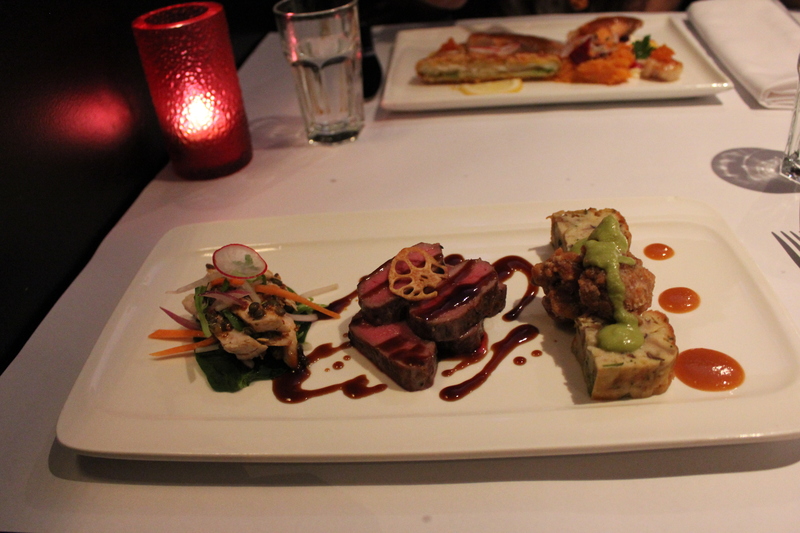 On one side it was crunchy succulent pork belly, the middle grilled pork fillet and on the other side, tempura bacon. My favourite was the tempura bacon as I have never had it before. On the side was some apple mango chilli sauce which complimented the juicy pork well. I recommend this dish to anyone who loves their pork belly. Not long after the Entree, our mains arrived. I had the Confit Duck for my main. The Confit Duck presentation was executed very well with precision. 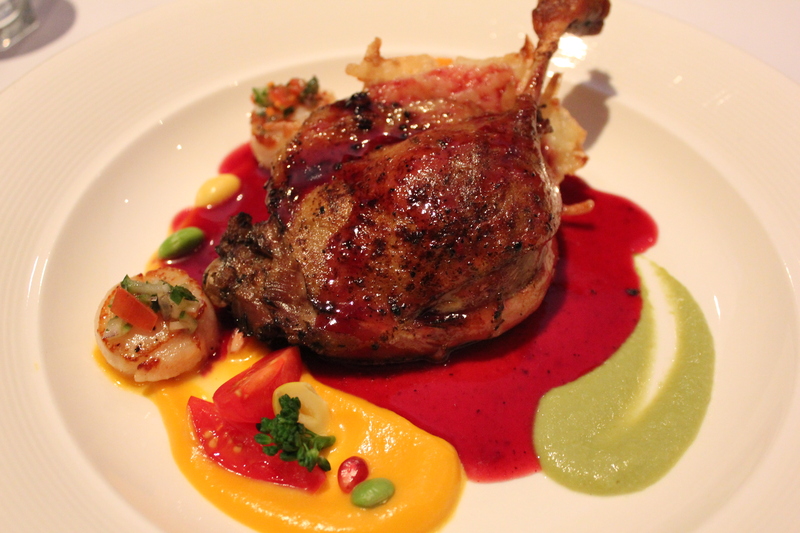 The Confit Duck was cooked to perfection as it was very tender which blended well with the red wine and mirin reduction. The grilled scallops, tempura onion and sweet potato mash compliments the confit duck very well. 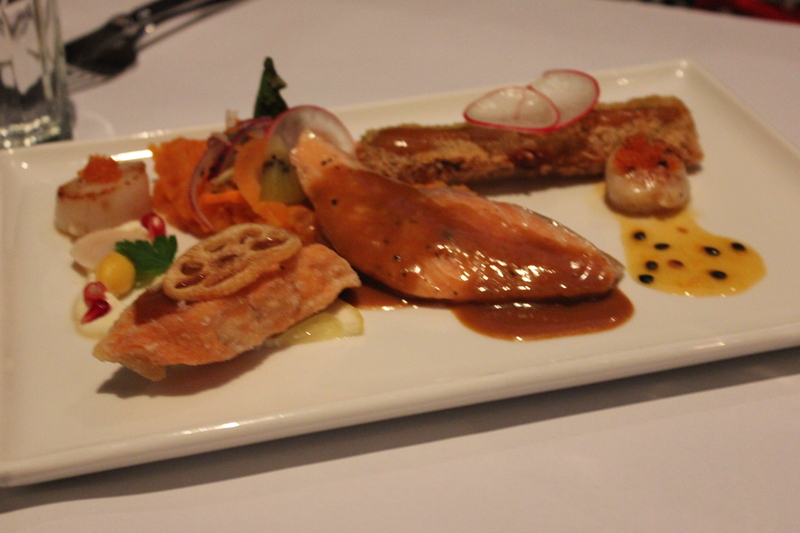 This was one dish that definitely showcase the fusion of Modern Australian and Japanese flavours. 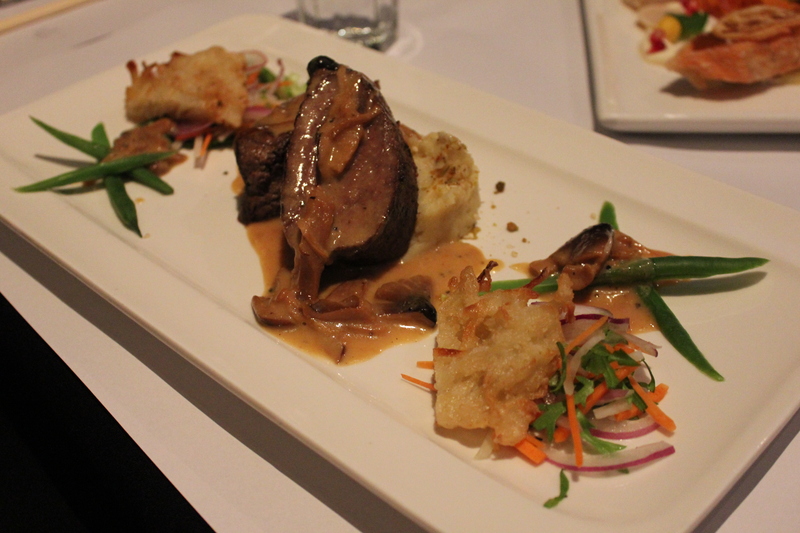 Cassandra’s review of the Chicken & Lamb: The Chicken & Lamb dish consists of poached chicken with lentil salad, grilled lamb in a balsamic sauce, deep-fried chicken pieces and a vegetable cake. The lamb was perfectly cooked and absolutely delicious. The deep-fried chicken and vegetable cake were well seasoned and had nice contrasting textures. I thought the poached chicken and lentil salad was a bit of a let down though because it was cold and had an overpowering ‘peppery’ taste that I didn’t enjoy. Overall though very nice dish! Clara’s review of the Tenderloin Steak: The tenderloin steak consists of Grilled Black Angus Beef Tenderloin Steak, Sautéed Mushrooms, Tempura Fried Onion, Nutmeg Spiced Mash, Fresh Greens, Dukkah, Creamy Rice Wine and Olive Oil Reduction. The beef was cooked to perfection – medium rare, juicy and tender. The mushrooms, dukkah, reduction and spiced mash complemented the beef well and enhanced its beautiful flavours. The Tempura Fried onion was scrumptious – crisp and non-oily like Tempura should be! On the down-side the fresh greens were a bit bland, but overall the main components blended well producing a dish that was sublime – truly a match made in heaven! To finish off the dinner, 5 of us had the Matcha Brulee (Green Tea Custard) for dessert and Cassandra had the Kuro Goma (Black Sesame) Gelato. 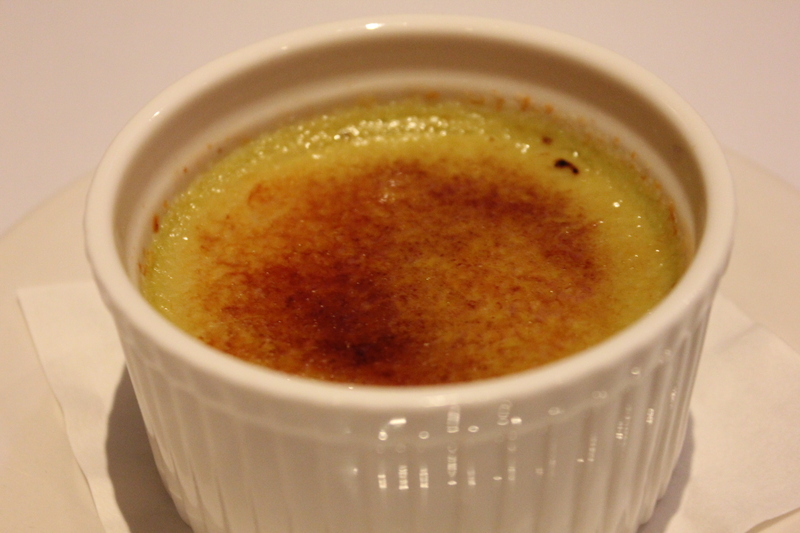 One spoonful of the Matcha Brulee and I was hooked. Another spoonful, I went to foodie heaven. It was so good, that after finishing it, I was left wanting more which I am sure the others on the table would agree. 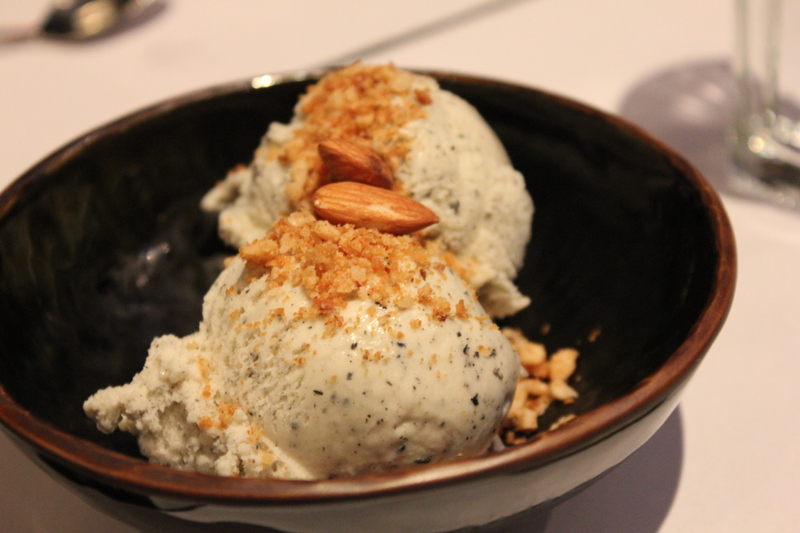 Cassandra’s review of her Kuro Goma Gelato: A great way to finish a delicious meal! I loved the taste of the sweet ice cream and how it contrasted with the salty nut topping. We were all very full and satisfied at the end of our dinner. Everything from the Entree to the Mains and Dessert were executed to perfection. Service was top notch. Nine Fine Food is BYO and bookings are essential as the restaurant is very popular. The atmosphere in Nine Fine Food is perfect for celebrating a special occasion, catching up with friends or a dinner date. I will definitely be back to Nine Fine Food in the future. To conclude this post, I would like to wish my friend, Clara a very happy 21st birthday! This place has been on my wishlist for forever! Hopefully I’ll make it soon, it looks delicious 🙂 I do so love toothfish! Nice site and pictures. Keep up the good work! Cheers Pauline! 🙂 Thanks for your support!